I was out the other day looking at some areas around Columbus and came across one of the worst bark cracking incidents that I have ever seen. The tree, seen on the right, is a typical maple that we would find in many newly constructed areas. Maples are used for a variety of reasons, including quick growth, good shade, adaptability, and good fall color. Sometimes plants that have so many good characteristics can be over used! What Causes Cracks in Trees? Looking at the cracking issue, there are a variety of potential causes. Most often we associate cracking on young trees with frost damage. 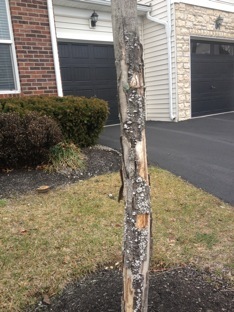 The freezing of young, thin barked trees, such as a maple, will often split causing this unsightly crack. Other causes of the cracking can be southern exposure, varying growing conditions (very hot and dry conditions followed by moist cool conditions), physical damage, and in some cases glyphosate has even been linked to splitting. So What Do I Do If I Have a Split? Plants are amazing organisms. Most often, especially in the case of maples, you will see the plant develop a callas over the wound. The plant has defenses similar to humans. Example being if you were to get a cut on your skin, you would develop a scab and eventually your skin would heal. Trees are very similar. They might have a permanent scar there, but over time the tree begins to heal itself. In some cases the open would can be an area where disease will encroach. Just like the cut on your skin becoming infected, some diseases will take advantage of the open wound. The best thing to do for a tree with cracked bark is to allow good air flow and monitor the over all health of the tree. If the tree is a potential hazard threat, consider having it removed, but most of the time you will see the tree heal over and continue growing! Cracked trees is just one of the possible issues you may face this early spring as winter comes to an end. Don't worry, Weed Pro has you covered with our ULTIMATE Money Saving Spring Lawn Care and Landscape guide that will walk you through making the most out of your lawn and landscape! The best part is that this guide is absolutely free by clicking on the button below!